Although summer officially arrived yesterday (June 21), temps have been pretty warm around these parts. Yes, we have had plenty of rain, but the hot, humid, muggy weather is definitely upon us. Not sure about all you other runners out there, but man, I gotta tell ya, the heat and humidity really get to me. My pace per mile slows down by about a minute in the summer. I am capable of doing a 10-minute mile or less when it’s not hot, but come summer and my pace is typically an 11-minute mile or worse. And I am not sure how to change that. Here’s a couple of things to keep in mind. First off, I try to run early when it’s not so hot out yet, but sometimes, the earliest I can get out is 9:30 a.m. and even though that may sound early, it’s not. It can be super hot by then. Secondly, I always bring a water bottle filled with Nuun hydration on runs longer than a 5K. 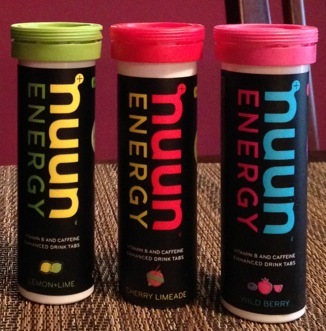 Nuun has tons of flavors and there are other hydration drinks out there as well, such as Osmo Nutrition, which I also love, thanks to my friend and fellow blogger, erin. (By the way, take some time to check out her blog, sweetsweatlife. It will be worth your time.) And lastly, I have finally starting wearing shorts, which again, I have to say was a big step for me. But my gosh, they really are much cooler and definitely more comfortable than I thought! Thanks again for all the encouragement and support when I blogged about wearing shorts for the first time. I think I might just be getting the hang of wearing these running shorts! Yep, I guess the shorts are working out for me! This is the Nathan water bottle I bring with me when I run. They are many different styles to choose from, but I have found I really like this one. I also found that putting a can cooler around the bottle really helps to keep it colder when it’s hot out and it keeps my hand from getting too cold! I usually start a run with it on my left hand and then switch every other mile to my other hand just so one hand/arm doesn’t get too tired of holding it. This is the Nuun hydration tablets I use most often. Again, there is a variety of flavors and not all of them have caffeine in them. I just like the ones with caffeine! The first pic (in the turquoise tank) was after about two miles. The second pic was after I was done – it was six miles total. And third pic was after a four-mile run. 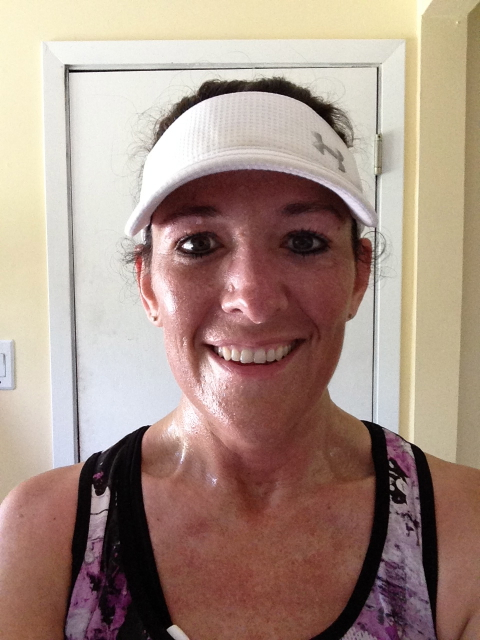 Yep, I get a little sweaty when running in warmer temps. And yes, I know it’s gross! If anyone has any other tips for running in the summer, please free free to share them. Leave me a comment at the end! I would surely appreciate it. 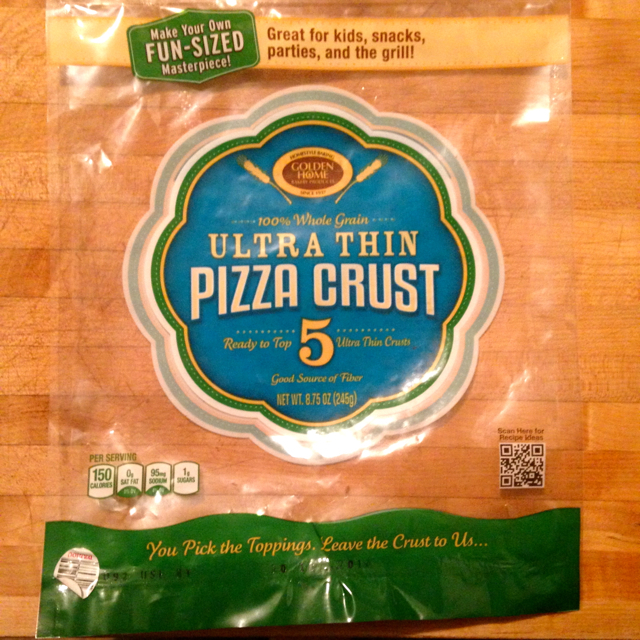 I meant to take a picture of what the crusts looked like in the package, but I forgot. At least you can see what the package looks like. We found these at Cub Foods in Brainerd. We haven’t looked at our grocery stores yet. Hope we can find these around here! We decided to make five DIFFERENT pizzas. And boy, were they good! 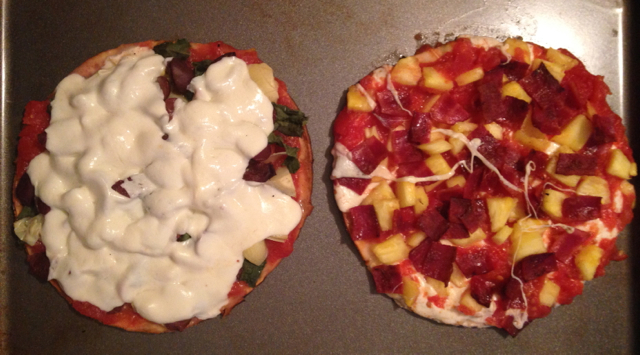 From top left, going clockwise: pizza 1 – homemade red sauce, fresh basil, artichokes, kalamata olives, grape tomatoes and fresh mozzarella; pizza 2 – fresh mozzarella, homemade red sauce, fresh pineapple and turkey bacon; pizza 3 – garlic infused olive oil, ricotta cheese, green olives, kalamata olives and shredded parmesan cheese; pizza 4 – garlic infused olive oil, mashed sweet potato, baby kale, ricotta cheese and pecans. And the last pizza? This one had garlic infused olive oil, gorgonzola cheese, roasted pears and toasted pine nuts! It was kind of like our dessert pizza. 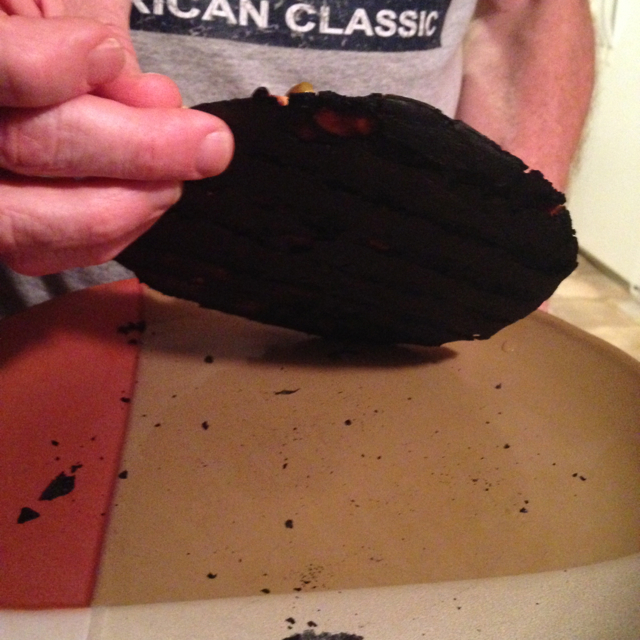 But oops, the crust got a little burned on this one. 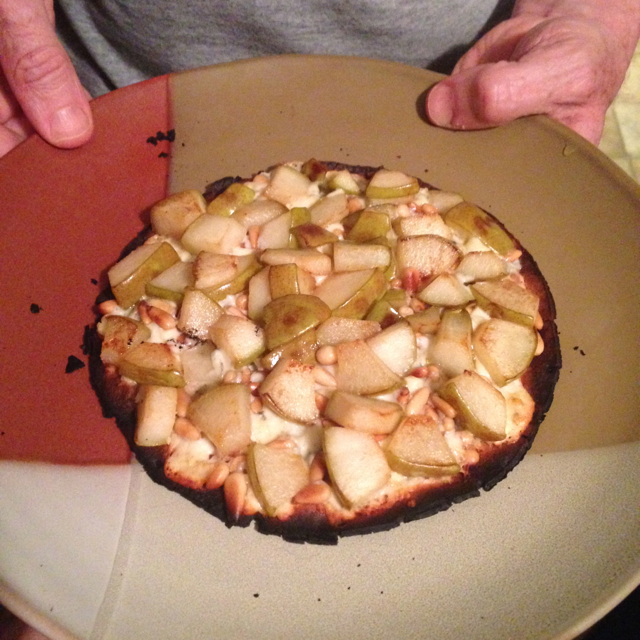 But we managed to kind of salvage it and just ate the topping scraped off the burned crust! It was actually pretty dang tasty! 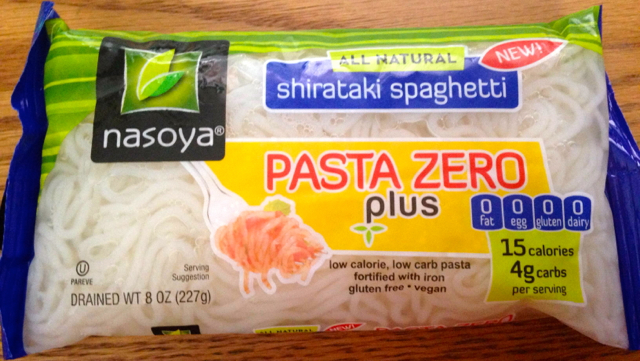 A couple of other new food finds that I haven’t tried yet are Nasoya shirataki spaghetti noodles. I heard about them at one of my Weight Watchers meetings and thought I would give them a try. My member said she had them and they weren’t that bad. Even her husband, who she described as a picky eater, tasted them and thought they were decent. I am excited to try them. PointsPlus Values are zero for one serving and only one for the whole package! And lastly, is cream cheese. 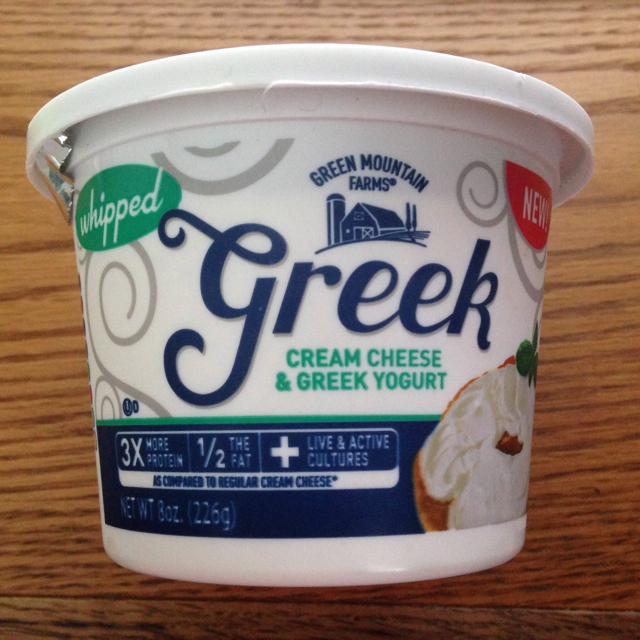 I have been hooked on bagels and whipped cream cheese lately and I found a new cream cheese, Green Mountain Farms Greek, which is a whipped cream cheese and greek yogurt blend. It has three times more protein and half the fat as compared to regular cream cheese. Two tablespoons only has 1 PointsPlus Value, which is a bargain! I like to mix cinnamon and a little Equal or Splenda into my cream cheese before putting it on my bagel. I can’t wait to try this tomorrow morning for breakfast! July 19: River Lake Days 10K Run in Richmond, MN. July 26: Pillsbury Push 10K in Kerkhoven, MN. The can cooler around the water bottle is genius!! That was always the thing – it could be 95 degrees but I did not like the feel of the cold, wet bottle against my hand. I finally found one with the bottle completely covered; it’s made by Amphipod. I’ve been using Kroger brand greek yogurt cream cheese but have never seen it under any other brand name. It’s good and love the 1 point value! I’m definitely going to look for that pasta! BTW, I came to this post from your Fat to Finish Line Facebook post. I hope you have something special planned for your 100th race: That’s quite a milestone! As far as running in the heat, pouring a few drops of cool water on my head has a huge effect. 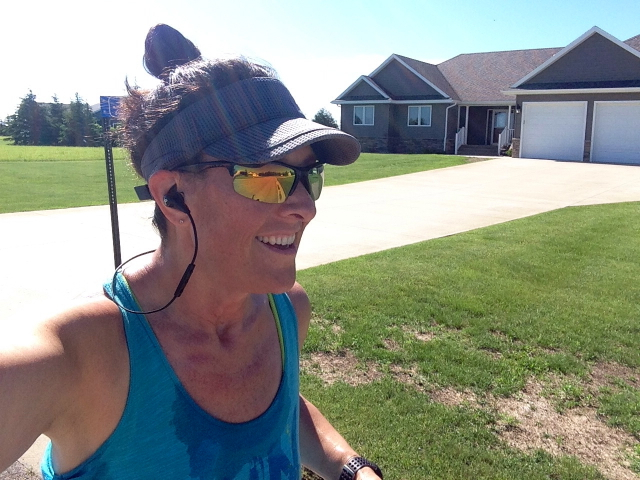 It may eventually run down and make my shirt even wetter than it already is and that’s not good for a long run, but if I’m really hot and have a mile left, I’ll do it! I think your legs are looking pretty good and so are the pizzas! One hundred races… amazing, Celeste! Keep it up! I run early to beat the heat (usually by 6a or 6:30a on weekdays) and carry my hand held bottle on longer runs (or coordinate routes with water fountains). Decided to step out of my comfort zone recently, too, and only wear a sports bra + shorts… it’s helped so much to keep me cool. You look fantastic in the shorts… show those strong legs proudly! I need to look into that Nathan water bottle. I’ve been running with the water bottles on my waist but sometimes the jiggling around gets on my nerves! 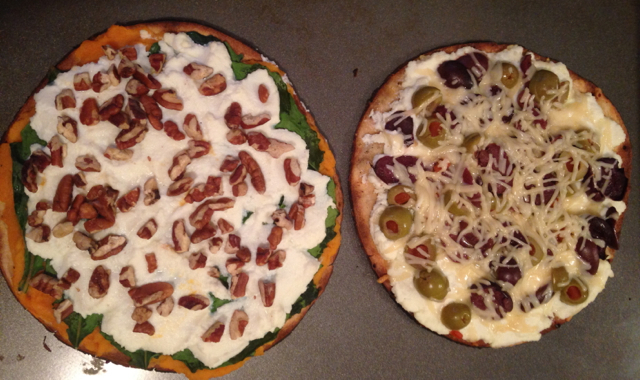 Those pizzas look great and why did I never think to put cinnamon IN my cream cheese? Great post! Previous Previous post: Holy trail, Batman!